"Mum when are you going to start your blog?" This was a question I was asked over and over again after I first muted this idea at the start of the year. Well after two years of reading other wonderful blogs I finally started Just a little less at the end of September. So after fifty consecutive days of posting what have I learnt? ◊ That I love writing. and wouldn't have discovered if I hadn't started this blog. ◊ That the blog community is supportive and friendly. people want to read about, both in this country and around the world. ◊ That I'm slowly getting better at photography. ◊ That I like a routine of regular posts for some days of the week. ◊ I like writing random posts too. ◊ That writing has to be personal and from the heart. ◊ That my family hate their food going cold if I'm photographing it. ◊ Posts about clothes and interiors are popular. ◊ There is never a right time to start a blog. ◊ Blogging about your interests or values can help keep you focused. I started this blog because of my enjoyment of reading other peoples' blogs. I wanted to create a blog which would inspire simple living and minimalism in the UK. I also wanted to create a personal blog that readers would feel at home with. Regular posting is something that's important to me when I read other blogs, so I'll stick with my daily posts, but I will let you know if I have to miss a day or two. As a newbie blogger, I am interested in knowing what you like reading about at Just a little less so please feel free to comment. Thank you all for reading, commenting and following. 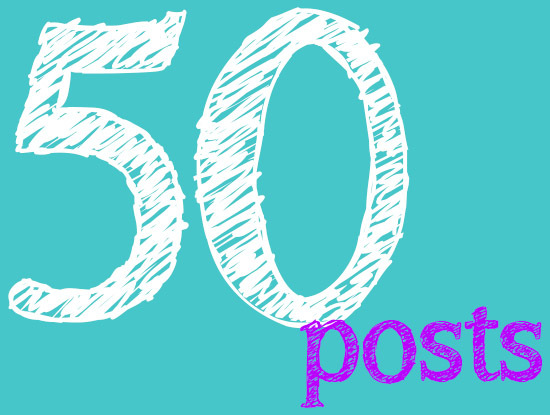 Congratulations on your 50th post. It made me smile reading through your comments about photographing food! I have experienced that too! The number of blogs I follow has increased dramatically since I started blogging because I keep finding great new ones! I haven't found yet a way of Keeping this to a mimimum!